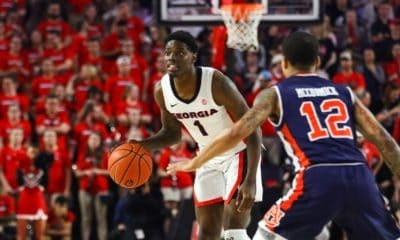 Athens, Ga. – The Georgia Bulldogs (12-7, 3-5) fell to the Arkansas Razorbacks 80-77 in the series’ first game that spilled into double-overtime on Tuesday night in Stegeman Coliseum. Double-overtime remained stagnant for the first two minutes until a tip-in by senior forward Yante Maten gave Georgia the advantage. 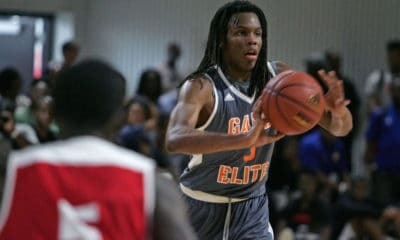 The game went back and forth with an Arkansas 3-pointer seconds later and two free throws from Maten regained Georgia’s edge. The Razorbacks drained another three, only for it to be answered by a three from junior guard William Turtle Jackson II to take the Georgia lead back 76-75. Arkansas again made a three to surpass the Bulldogs at 78-76. Maten drew a foul and made 1-of-2 from the line, pulling within one and a defensive stop on the ensuing Arkansas possession gave the Bulldogs a shot. 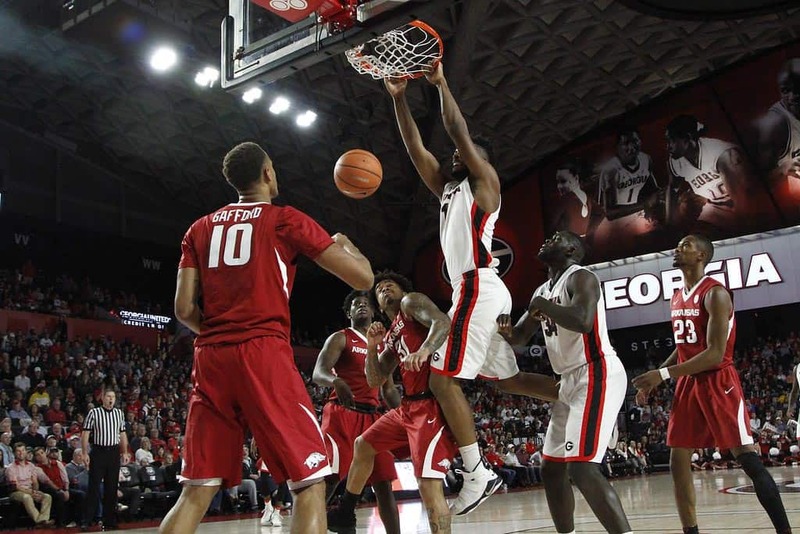 That last attempt fell short and the Razorbacks held on to defeat the Bulldogs 80-77. Maten had his ninth double-double of the season and 25th of his career with 26 points and 15 rebounds tying his career-high in boards. Maten has eclipsed the 20-point mark in 10 games this season including three of the last four. He is also now tied for overall career points with former teammate J.J. Frazier. Jackson posted a new career-high for three’s with 5 contributing to his overall 15 points. Twenty seconds into the game Jackson posted a three clinching the Bulldog’s lead, which held till the half. Georgia stretched its lead to as high as 16, before the Razorbacks (14-6, 4-4) made it a five-point game going into the break at 33-28. Coming back to action, Arkansas had the first points of the half but Georgia held onto the advantage. At 16:21 the Razorbacks took over the lead, 38-37, for the first time. Strong defense on both sides contributed to the lead changing six times within 12 minutes. Arkansas gained its largest edge of six points at 7:45 but Georgia was able to come back and tie the game, 58-58, with 3:55 remaining. The lead changed three more times ending with Georgia at the line. Two free throws by Jordan Harris sent the game, 63-63, into its first overtime. A Georgia foul brought Arkansas to the line to take the first lead in extra time. Freshman forward Nicolas Claxton answered with a jumper to regain the Bulldog advantage. With 1:32 remaining, the Razorbacks hit a three to go up 69-66. 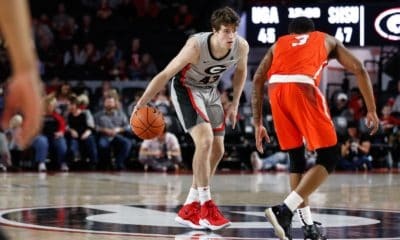 A Claxton bucket and a block on the defensive end brought Georgia back on offense. Harris forced a foul to go to the line again to tie the game, 69-69, segueing into double-overtime. Red-shirt senior guard Juwan Parker had his seventh double-digit game of the season with 12 and recorded a new career-high in blocks with two. Junior forward Derek Ogbeide tied his career-high of assists with three as well. Of the last four meetings in Athens, Arkansas has gone into overtime three times, including tonight, but this was the first double-overtime. The Razorbacks were also unable to gain a lead larger than six on the Bulldogs throughout the entirety of the game. The game featured two of SEC’s top-three scorers in conference play and overall with Maten (19.6 ppg) and Jaylen Barford (19.2 ppg). Each led their team with 10 at the half and finished with over 20 points. Barford had 24 points. Georgia returns to action on Saturday, January 27 at 2 p.m. against Kansas State in Manhattan, Kansas. • The double-overtime game marks the first in the Georgia-Arkansas Series. The series is split in the last four games played in Athens with three needing overtime. All four contests were decided by five points or less. • With :41 seconds left in 2OT, Yante Maten knocked down a free throw to pull within one. The point tied him with former teammate J.J. Frazier in career points at UGA. • All 15 points and shots (career-best 5-of-8) from junior guard Turtle Jackson came from 3-pointers. Threes represent 35 of Jackson’s 62 made field goals this season. 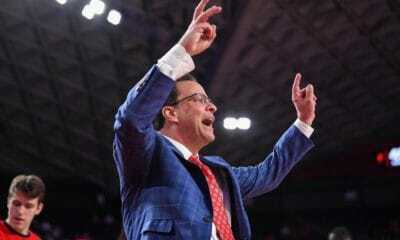 • From the free-throw line, the Bulldogs went 20-of-26, while the Razorbacks were 11-of-14. Maten finished 13-of-16 from the charity strike, his third time this season tallying double-digit points from the line. • The game featured two of SEC’s top-three scorers in conference play and overall with Yante Maten (19.6 ppg) and Jaylen Barford (19.2 ppg). Each led their team with 10 at the half and finished with over 20 points. Barford had 24 points. • Georgia held the lead throughout the first half. The second half and overtime consisted of 17 lead changes and nine ties. The largest lead of the game occurred in the first half with the Bulldogs up by 16 points. Arkansas led by as much as six points in the second half.